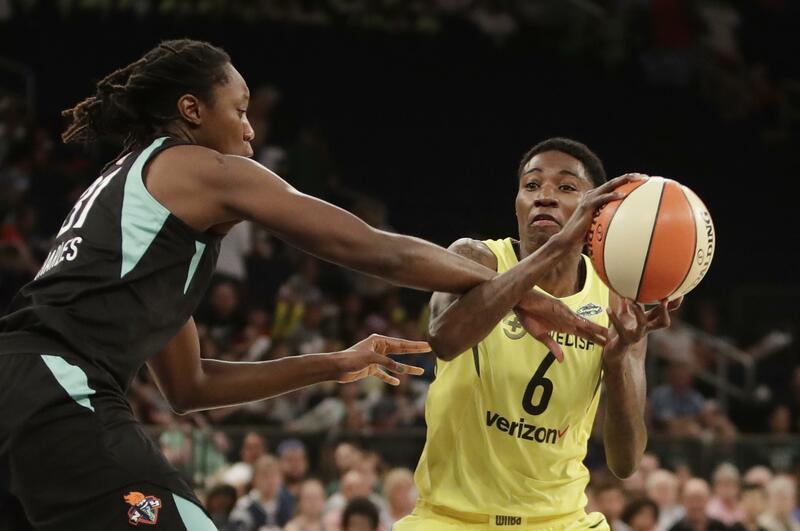 Mon., Aug. 6, 2018, 10:36 a.m.
NEW YORK – Breanna Stewart scored 32 points to help the Seattle Storm beat the New York Liberty 96-80 on Monday afternoon at a camp day game. Natasha Howard added 14 points, 10 rebounds, five blocks and five steals for the Storm (22-7). Seattle trailed 74-72 early in the fourth before Stewart’s three-point play sparked a 15-0 run that gave the Storm the lead for good. It’s New York’s longest losing skid since dropping the final seven games of the 2013 season. This was only the second game at Madison Square Garden this season – both were kids day games. The Liberty moved all the other home games to the Westchester County Center, which seats 2,500. Buoyed by the energetic crowd, which included owner James Dolan and Chelsea Clinton, New York got off to a strong start against the WNBA’s top team. The two teams were tied at 44 at the half. Seattle has already clinched a playoff spot, while New York was eliminated from the postseason with its loss Saturday to Indiana. It’s the first time since 2014 that the Liberty didn’t make the playoffs. Published: Aug. 6, 2018, 10:36 a.m.